We have installed a new plugin called Share/Save that allows your readers to share your posts using services like Facebook, Twitter, Google Buzz, Delicious and many more. At the bottom of each post, you will now see a Share/Save button (Figure 1) that will make it easy for your readers to share your posts on many sites. The settings for Share/Save are available from the Admin panel. From the Admin panel (Dashboard), select Settings. Among other options, you can choose which button and individual icons to display and where and how to display them. 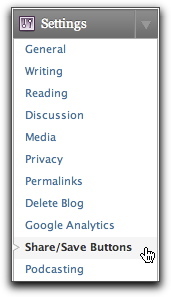 If you do not want to use Share/Save on your Blog, you can disable the display. The Share/Save button will no longer be displayed on your blog.